Colonel, Best Painted Open Comp. Thats a fantastic looking vehicle, I prefere it to its bigger 6 wheeled brother. At £30 its a a snip. Will have to get me a few of these. Would it be wrong to put cadian models in it? Send me the Elysian crew and all will be forgiven. All the Emperor requires of us guardsmen is that we stand the line and we die fighting. It is what we do best. We die standing. 30 pounds....fools dreams do come true every once and a while thank you forge world. You made a product i will give a few fingers for. There is a saying: yesterday is history, tomorrow is a mystery, but today is a gift. That is why it is called the "present". Wow! Roughly 60 bucks a pop, so much for running a squadron of them. Guess I will stick to drop sentinels. Any word of IA8s release date yet anyone? Any word of IA8s release date yet anyone? Check the Rumor Forum....That's why it exist. Dash its only 45 bucks which is cheaper then a hellhound kit....its ironic that a forge world product is cheaper then GW. Just wondering if anyone knows which book i have to buy to get the rules for these new models from FW. All 3 are awsome peices. A while ago i was thinking that they were gonna release a new book that included these rules, but now i feel like i have missed a memo somewhere. 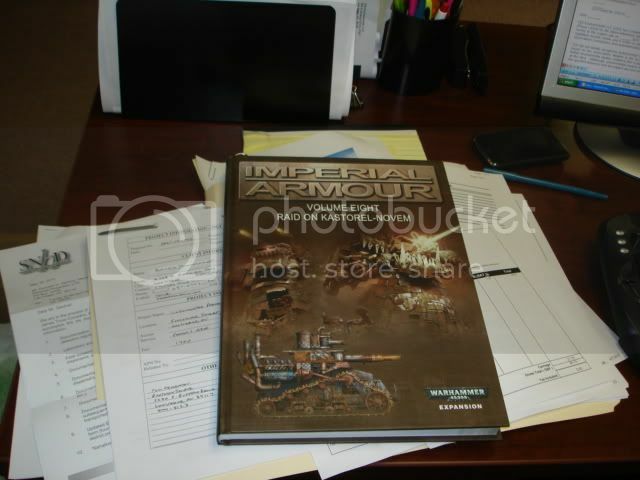 I know some very old rules for Elysians are in imperial armor 3. But they dont include these vehicles, and are so old they barley apply anymore. anyone know? or heard rumors? The book with the rules for these vehicles hasn't been released yet. It should be out by the end of May or so, I believe. You haven't missed the memo. As our local Elysian Colonel has already said, the book with the rules for these new toys hasn't been released. The next edition of the Imperial Armour books will feature these pieces, and possibly a revised Elysian Army List. Just be a little patient....it's coming....Soon! sweet, thanks for the update. gotta save some cash now, cause i know the book + models is gonna add up fast. I bet the sky talon will be just like the old FW rules for the valkyrie model but can carry the two new buggies. Basically: can transport the models around. My videos from exploring abandoned buildings, 40k battle reports and airsoft. Comments are always welcomed. Yep, sounds like the new Elysian rules will be in IA8: Something Kastorel Novem, IIRC. Should be pretty cool, I'm looking forward to it. You can always try Ebay to find some cheap. Or maybe doing some trading on this website. As did I first thing this morning. The book getting here will be the next problem. Considering the previous volume looked like it had received ground fire sometime during the flight. It helps to have a battle bunker near by and a manager who will be ordering a few copies. I got dibs on one copy already. WOO HOO! Elysians, might get tempted to restart my elysian force. Looking forward to this book! Ah hah! Time for some (more) slacking at the office. course after it arrives im just gonna want to order some models... curse you expensive hobby. Sooo looking forward to this book. My interest in 40k and the IG has waned in recent months. This is a nice influx of fresh thoughts, ideas, and models. Ordered mine last weekend along with a pair of Vultures Hoping maybe next week they will arrive, they say shipped on the FW site.